Want the perfect birthday breakfast? 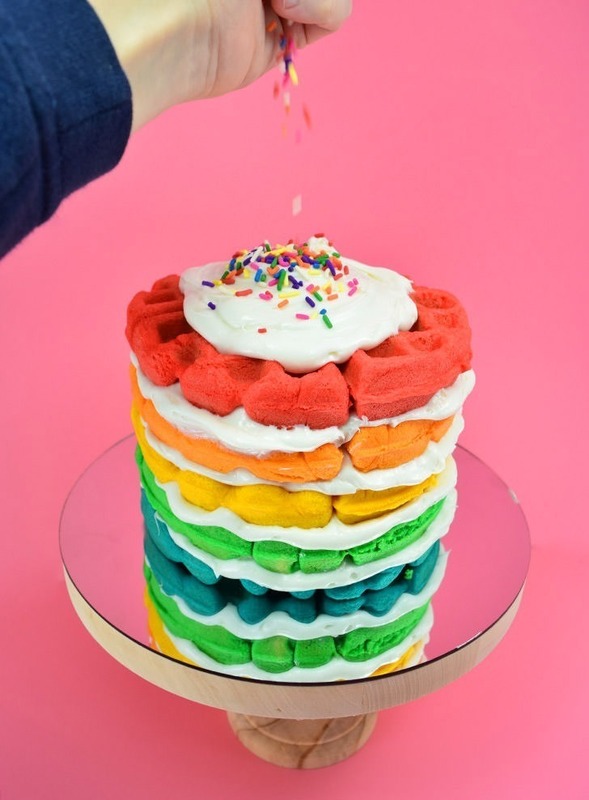 Check out this awesome waffle maker rainbow layered cake that is super easy to make and won’t heat up the kitchen! It gets super warm here in South Texas and sometimes I like to keep the window open in spite of it. While some of y’all are sitting with snow still on the ground it’s a sticky 85° here and the humidity has driven me to shut the windows and turn on the A/C. But I had a lovely stretch of 70-ish° days and I kept the windows open from the moment I woke up until right before I went to sleep. It was awesome. When it got to be in the higher 70s it got a weensy bit warm in the house because NONE of the windows on the front of the house open up. They’re all decorative and very pretty from the street but that, unfortunately, means I get no cross breeze to help cool business down. And then a dilemma occurred… I wanted a reason to use my fancy new cake plate I had made but I didn’t want to have to close the windows and turn on the A/C to do it. Because, inevitably, the oven heats the house up like crazy and even if it’s nice outside, it will swelter inside without that breeze. YUCK. 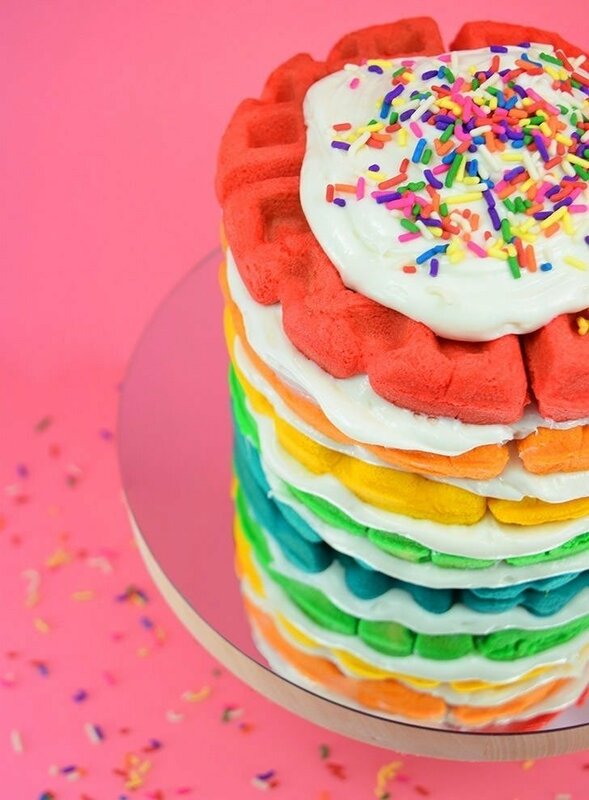 Looking through my notebook of ideas I’ve had since I started this blog in 2012 I came across “rainbow waffle cake”. Seeing as how I got a bazillion boxes of white cake mix on clearance and food coloring is never in short supply around here I made myself because Mr. 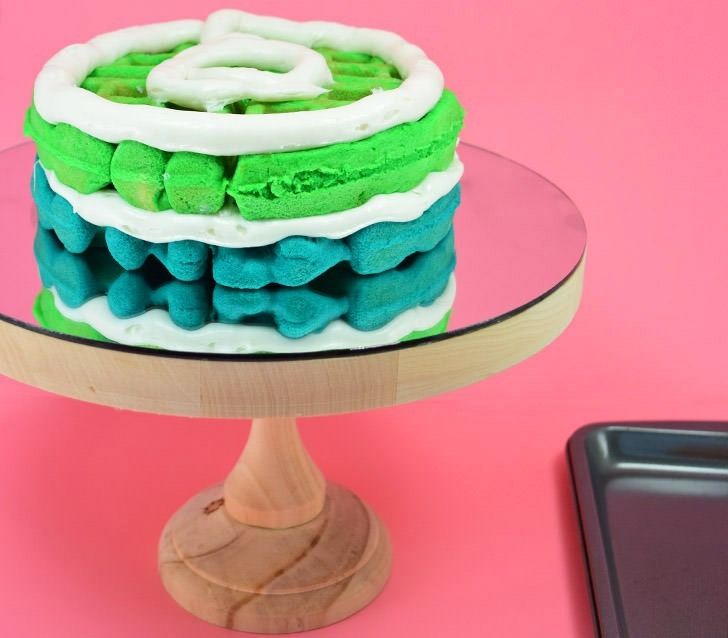 Rob is on a healthy kick and won’t budge, a rainbow layered cake using only the waffle iron. And guess what? It didn’t seem to heat up the house one, little, bit. Huzzah! I’m thinking that this awesome method of baking a cake in a waffle maker is going to be such a hit around summer time when heating up the house is really, really an issue. Plus, wouldn’t this make the sweetest thing to wake up to on your birthday morning? I think it just might! 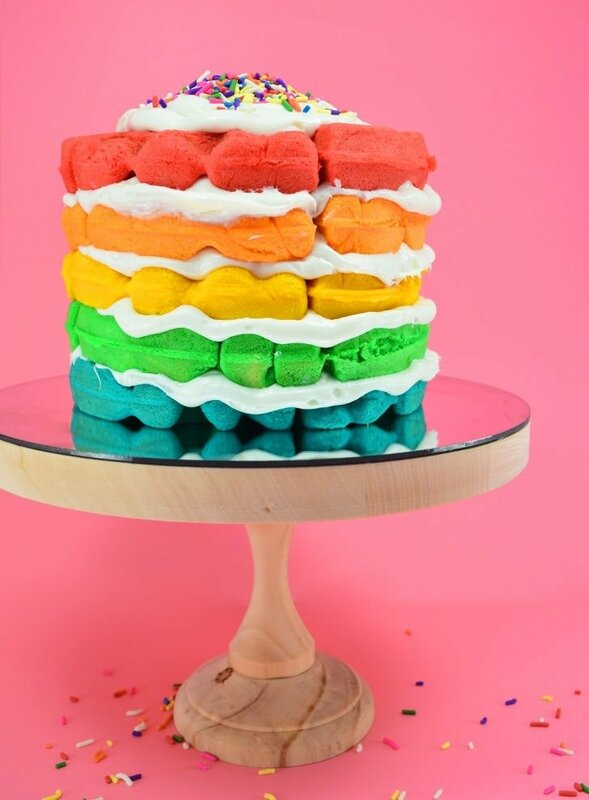 Grab the waffle iron and let’s make a rainbow layer cake! 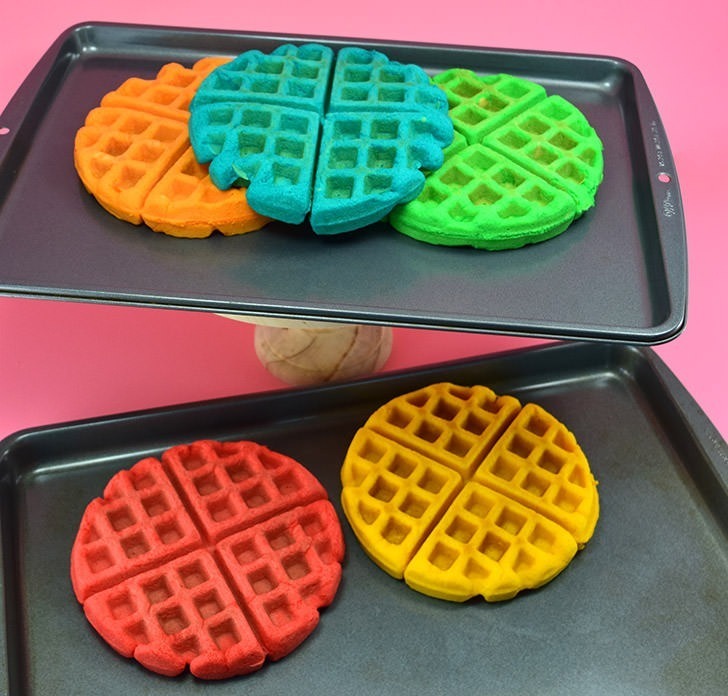 First thing’s first you’ll need to make a whole mess of colorful waffles. I used 2 boxes of gluten free cake mix, but that’s mostly because the brand I use puts less in their boxes than a traditional cake mix would have. With 2 boxes of Betty Crocker Gluten-Free Cake Mix, I made 7 total waffles though I only needed 5. 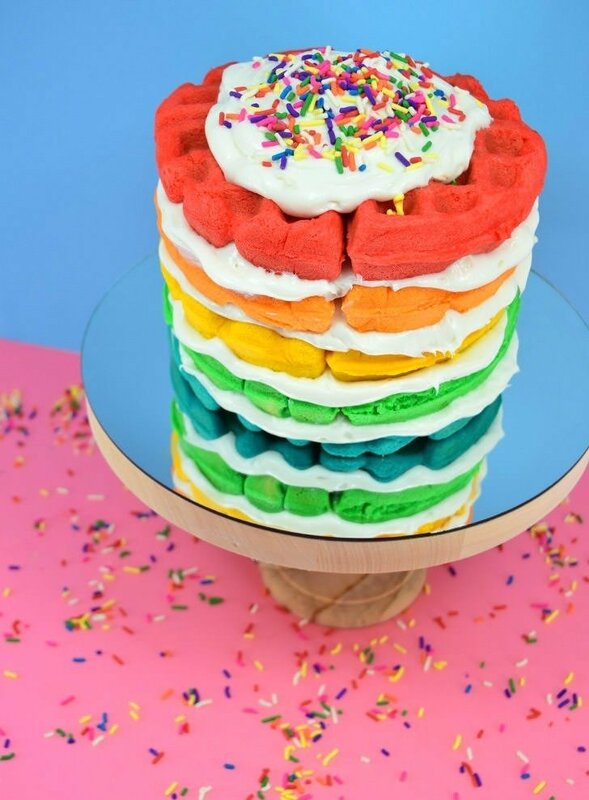 I would think that with a normal box you could eke out 5 waffles for a fab rainbow color scheme BUT you might want to grab a second box of cake mix and the supplies to make it just in case! Make the boxed mix according to package directions. 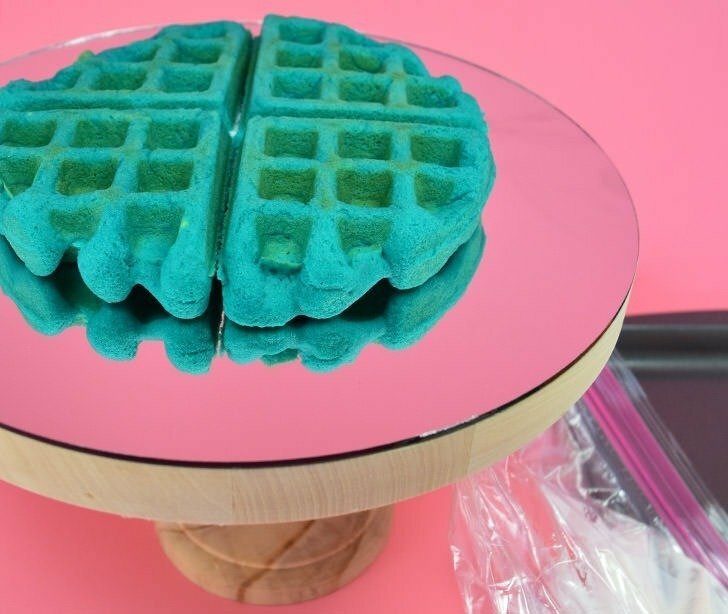 Rather than get 5 bowls dirty I scooped out 1.5 cups of batter into a bowl, tinted it, cooked it in the waffle iron, washed the bowl while it was cooking, and then started all over again once that color was done. All in all, it took me around 40 minutes to make my 7 waffles but the time seemed to go pretty darn quickly! Color 5 waffles to be, red, orange, yellow, green and blue. Each time you flip your waffle out of the iron move it somewhere to fully cool. A wire rack is a good idea and will help the waffle cake layers cool faster, but with gluten-free, you really, really have to be careful to keep from breaking things so I slid mine from a plate to a cookie sheet and let them rest a few hours. No matter how you cool yours, make sure they cool completely before moving on to building and frosting your waffle cake. Load up your frosting bag with jumbo piping tip in place and let’s go! (p.s. I’m using a gallon zipper bag because I ran out of piping bags and it worked really well!) 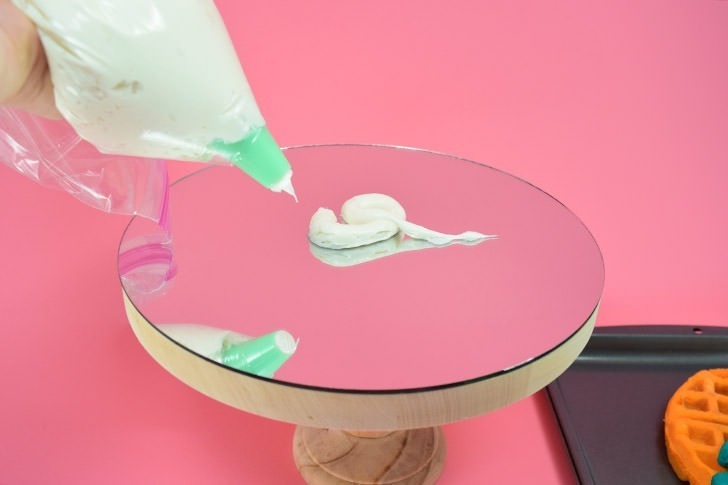 Place a dollop of icing right in the center of your cake plate to keep your cake from sliding around. Going in ROYGBIV order stack your first cake onto the cake plate, making sure to center it as well as possible. Squeeze a fat dollop of frosting in the middle of the cake waffle and spread out into the waffle’s gaps. Squeeze a thick line of icing around the outer edge. Stack the next color in the order on top of the first, pushing down to allow the icing from the previous layer to ooze out a bit. Turn the cake stand to make sure that your stacking looks good and even from more than just the front angle. Spread the icing in the center to fill the gaps. Gluten-free cake is crumbly pretty much all of the time. As such it was kind of difficult to transfer the cake waffles on top of the others without any breakage but the good news is if your waffle breaks into quarters you can just stick that wedge back into business and keep going. 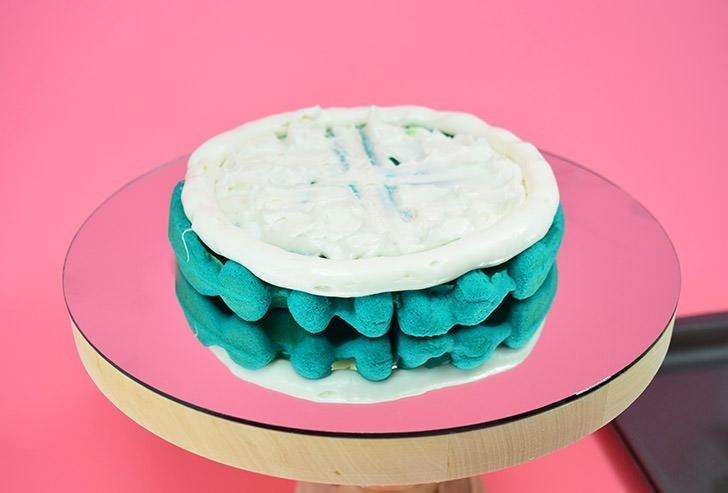 Once all of your layers have been stacked glob on your remaining frosting in the middle of the top and sort of spread around to be an attractive glob :) Sprinkle the top with rainbow sprinkles and clean up any messes on your cake plate and you’re done! Unfortunatley my cake was a bit dry in between the layers but it will still lovely and turned out far prettier than I expected. 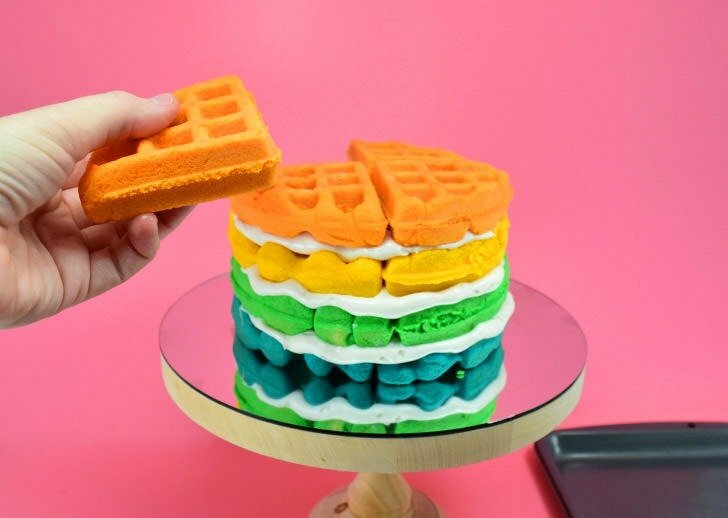 If you love waffles and you love cake, and you love not heating up the whole house to bake up some sweetness, this waffle maker rainbow layered cake is gonna be your go to dessert!